In a smear of irony, the Attorney General for the state of New York, Eric Schneiderman, who can be recognised as one of the toughest opponents of the Daily Fantasy Sports (DFS) industry, had to defend the legality of a new DFS law in a court filing earlier this month. The case was fought in front of the County of Albany Supreme Court. 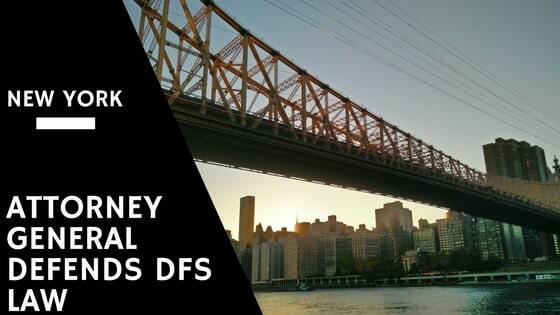 The New York Attorney General spent the better part of last year, 2016, arguing that DFS sites such as the likes of DraftKings and FanDuel were operating illegally in the state of New York. This was said with consideration to the previous state gambling laws that were in place. The final sprig of the legal dispute with Schneiderman, which had stemmed from false advertising claims, also came to a close in October of last year. The case was settled with the payment of USD 6 million from each of the two DFS operators to the residents of New York. A new law legalising and regulating DFS in New York was introduced last year in the summer of 2016. However, soon after the law was established, a group of citizens filed a law suit claiming that such a law violated the state constitution. Their efforts were spearheaded by an anti- gambling group called Stop Predatory Gambling. Stop Predatory Gambling is a non- profit group, which is based in Washington, D.C. It is a national, trans- partisan, government reform network of individuals, family members and organisations. Members come from diverse backgrounds, political convictions and religious faiths. The group’s mission is to improve the lives of the American people. They hope to use education and advocacy to free the nation of the dishonesty, exploitation, addiction and lowered standard of living that comes from commercialised gambling. The roots of the movement can be traced to the early years of the 1990’s, when extensive efforts to bring commercial gambling into local communities took off. The defendants in the case were the New York State Governor, Andrew Cuomo, who signed the gambling bill into law, as well as the New York State Gaming Commission. The latter of the two is now in charge of DFS regulation in the state while the state AG, Schneiderman and his office remain in the position to act as counsel. As part of the case, Schneiderman entered a “memorandum of law in support of motion to dismiss” in the case. In the new filing, Schneiderman attempted to refute the claims of the plaintiffs. They stated that the New York DFS law violated Article 1, Section 9 of the state constitution. It further stated, “Consistent with that authority, the Legislature has enacted L. 2016 Ch~ 237 (“Ch. 237”), which resolved the legal status of specific internet games known as interactive fantasy sports and declared that such contests properly fall outside the definition of gambling in New York as defined in the Penal Law.” He also mentioned that while the article and section in question does not define gambling, it extends the authority to suitable lawmakers to do so. One of Schneiderman’s final arguments mentioned that various other states have done the same thing. He mentioned that a variety of state legislatures have come to the same conclusion that DFS should not be treated as gambling. He then went onto list the states that have already legalised and regulated DFS last year and defined them as falling outside of the gambling code. It can be noted that his analysis ignored the fact that a number of State Attorney Generals have issued opinions that have grouped DFS as a gambling activity under current or previous state laws. As we all know, Schneiderman was also among those AGs that considered DFS an illegal gambling activity until recently. The new turn in events obviously puts him in an awkward position. He now has to defend something his office battled throughout 2016. This was at least partially on constitutional grounds. In both the cease and desist letters he has sent to the DFS operators, DraftKings and FanDuel, Schneiderman raised the constitution. This was again flagged up in the request for their injunction as well as throughout the legal battle. It is expected that Schneiderman would now say that he would not have used the same language if the current law had always been in place. It is also safe to assume that he would not have taken the actions against the DFS companies either, had the law existed previously. When the new law had been established, Schneiderman, maintained that his job was to protect the law in the state of New York and he had filed the lawsuits against the DFS firms when their activities were in violation state laws. However, with Cuomo signing the bill and changing the state gambling laws, it was now his job to protect the new laws, and as always, the residents of the state of New York. According to a notice filed by Schneiderman, the state will present a motion to dismiss the case on the 24th of March 2017. Once that has been done, the lower court would either dismiss the case or rule on its merits. Whatever the outcome, it is almost entirely a cerainty that the case will be appealed to a higher court in the NY court system.